The 2018 Mazda CX-3 has been significantly improved over the 2017 version of the subcompact crossover. It’s nothing you can see, and it’s not easy for a manufacturer to hype, but a number of updates improve the car: new suspension bushings, control arms, engine mounts and more sound-deadening material. Such improvements occur year after year, with Mazda, and many updates go unreported. The CX-3, built on the platform of the subcompact Mazda 2, was introduced for 2016, and has sold well. It’s sporty, attractive, practical, affordable, economical, and fun to drive. The CX-3 is front-wheel drive, with available all-wheel drive. It uses one powertrain, a 2.0-liter four-cylinder engine mated to a 6-speed automatic transmission. With a modest 146 horsepower and 146 pound-feet of torque, it manages to deliver enthusiasm and energy not often found in the crossover SUV world, while bringing EPA-rated mileage of 31 Combined miles per gallon, among the best in its class. Its top rival might be the Honda HR-V, which gets similar mileage. Another competitor, the Chevrolet Trax, gets similar mileage, as well. The CX-3 gets top crash ratings by the National Highway Traffic Safety Administration, with five stars overall, including for frontal and side impacts (four stars for rollover). The Insurance Institute for Highway Safety gave the CX-3 its top Good ratings in each test, naming it a Top Safety Pick Plus. 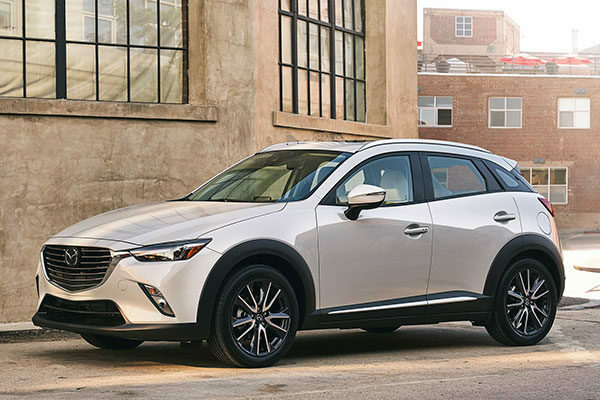 For the top CX-3 Grand Touring model, there is an available group of active safety features, including lane-departure warning, adaptive cruise control, automatic emergency braking, adaptive headlights, automatic emergency braking, and rain-sensing wipers. It’s called i-ActivSense, and is affordably priced. Mazda CX-3 Sport ($19,960) includes air conditioning, Mazda Connect infotainment with a 7-inch touchscreen, rearview camera, cruise control, power windows/locks, tilt/telescoping steering wheel, keyless start, and Bluetooth streaming audio and phone connectivity. Six airbags are standard. CX-3 Touring ($21,960) adds blind-spot monitoring with rear cross-traffic alert, six-speaker sound, a leather-wrapped steering wheel, and heated mirrors. An optional Tech Package includes premium Bose audio, a panoramic moonroof, satellite radio, HD radio, and a cargo cover. Grand Touring ($24,990) comes with paddle shifters, a head-up display, leather seat upholstery with suede inserts, heated front seats, LED adaptive headlights, LED foglamps and taillights, Bose seven-speaker audio, satellite radio, navigation, and automatic climate control. The i-ActivSense is optional ($1,170). In a world of look-alike crossovers, the CX-3 stands out. Its stylish exterior follows Mazda’s Kodo design language, developed some years ago. It’s simple but not dull. The sheetmetal blends sensuous and flowing forms with gently complex shapes, to come up with a profile that’s both athletic and elegant. The cabin is sporty and tasteful, things not generally found in a subcompact crossover. It feels like the stylish Mazda3 hatchback. The instrument panel is neatly laid out, with surrounding soft-touch components, giving a premium look and feel. The climate controls are sturdy, the steering wheel simple and modern. Unfortunately the monochrome gauges overdo the minimalism, and bring basic down to a feeling of low-budget. The head-up display that’s standard in the Grand Touring model brings it back up a bit, but the display isn’t crisp enough. The cabin space is more or less good for a subcompact, in some places more good than others. In the front seats there’s enough head, leg, and shoulder room, but the rear seat is less inviting. Legroom is about the same as a BMW 3 Series, but the CX-3’s sloping roofline sharply reduces head room in the rear. The rear seats fold down to expand the storage space onto a flat cargo floor. We love this in a subcompact crossover. The sloping liftgate, so stylish from the exterior, doesn’t significantly affect the space inside. With the rear seat up, the cargo capacity is an acceptable 12.4 cubic feet, growing to an impressive 44.5 cubic feet with the seatbacks down. The CX-3 delivers brisk performance and sharp handling for the class. When you step on the gas, the 146-horsepower engine responds smartly. The CX-3 weighs a mere 2,809 pounds, and that helps. All-wheel drive adds about 143 pounds, and lowers the fuel mileage by 2 mpg, but it doesn’t detract from the CX-3’s acceleration or ability to maneuver nimbly through corners. Mazda is known for sharp dynamics and a superior driving experience, and the CX-3 does not betray that. That’s saying something for a subcompact crossover. Its personality is sporty and its road feel abundant. It inspires a refreshing level of confidence along with the motoring pleasures. On the highway and during suburban jaunts, the 2.0-liter engine typically purrs quietly. In the city, however, especially when merging into traffic, you can hear it growl. Pushed hard in Sport mode, the engine responds vigorously, willing to rev toward its 6500-rpm limit. But the sound it makes isn’t so satisfying. Paddle shifters are standard on the Grand Touring, but unavailable for Sport or Touring editions. The 6-speed automatic on those models may be manually-shifted using a gate on the gearshift lever. The Mazda CX-3 is sporty, attractive, practical, affordable, economical, and fun to drive. It’s safe and has vast cargo space for a subcompact crossover. Mostly, it’s quick and nimble compared with the rest of the class.